In personal finance we may or may not hear of the phrase “The Bare Essentials” but what does it mean and what are the implications of it? 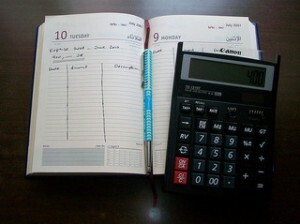 Photo by pshegubj showing a blank expense journal. Every time I hear of someone cutting back to the “Bare Essentials” I get a visual image of the person cutting every single expense out but what is needed. No cable TV, park the car, etc. But is this the real meaning or do you need to see another meaning? I believe there’s another meaning. Let me explain, if I was to cut back to the bare essentials then I would cut my eating out way down for starters. But that wouldn’t be the “bare essentials” as I could cut eating out altogether, leaving myself to only eat Peanut Butter and Jelly each day. But your starting to see another meaning. Plus, I’m not sure about you but I wouldn’t like PB&J each day. Same thing with all of your other expenses, although a few expenses should be cut completely unless it is needed for a job, etc. If your cutting to the bare essentials I’d fully expect you to cut your TV service or downgrade to the cheapest package possible. While others such as fuel are limited in the amount you can cut. Depending upon your job you will not be able to just not come in. Most bosses wouldn’t enjoy that. So how come when we hear of the “Bare Essentials” we take it to literal vs just almost-extreme expense cutting? This entry was posted in Article by Zackary. Bookmark the permalink.